You need content. And by content, we don’t mean any random pictures. We mean quality photos that appeal to your audience. It’s not just about the pictures – it’s about getting more fans, boosting your engagement, and improving your performance. To make it simple: posting high quality pictures will visibly increase your number of followers. So how do I take great photos? 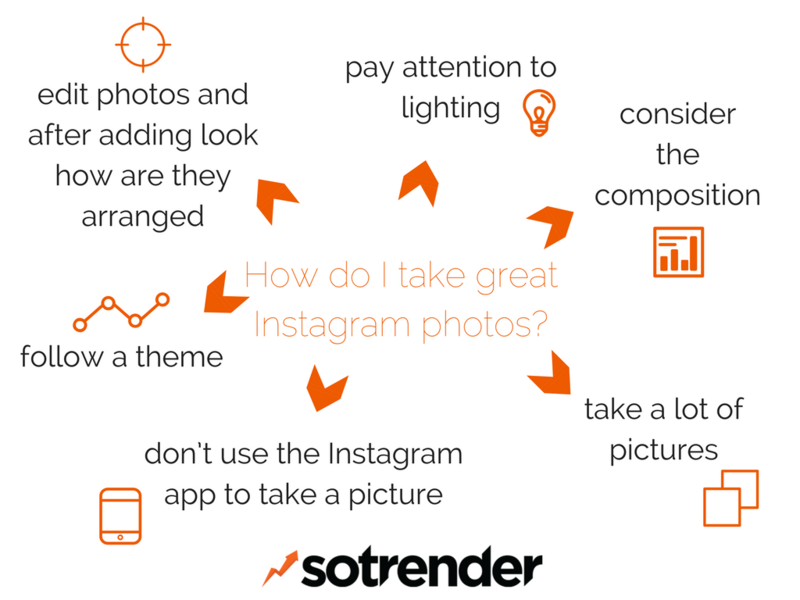 Follow these tips when taking Instagram photos – they will help get the most of your content. Firstly, pay attention to lighting. Make sure the photos you take are clear and have a lighting the set and match the tone of your brand. Don’t use the Instagram app to take a picture. It doesn’t have the same capabilities that your normal camera phone has. Just use your phone’s camera app and select the photo from your Library through Instagram. Consider the composition of you photo. Make sure everything is in it’s right place, and experiment with different ways of what and where the focus of your photos is. Take a lot of pictures. Taking a great photo in one try is rare. Follow a theme. Use common tools and similar settings for your photos. Make it clear that this photo is definitely from your brand. Images will appear next to previous ones on your profile. Consider how they’re arranged so that they look good together. Contrast can make your colours stronger or weaker. Adjusting the brightness is can make things clearer or unnecessary parts of the photo less clear. It’s often overused, so don’t overdo it. Warmth helps set a ‘sweet’ tone in photos. Increasing it will give your photo a more minimalist look. Saturation will help you adjust pictures that have too much lighting. Shadows and Highlights can hide distracting parts of your photo or highlight important parts. Sharpen will make edges harder or softer in your image. These tips will help improve the quality of your Instagram photos.